Environmental Accounts aim to recognise the interaction between built, social, human and natural capital required to produce human well-being. The following diagram provides a schematic of this relationship. We are participating in the development of this nascent discipline, capitalising on our consultants’ extensive experience in putting a value on environmental assets and ecosystem services. This will facilitate better decisions and reporting of outcomes from environmental management investments and policy and program implementation. Natural Capital advice: we provide high level first-pass assessment on how Natural Capital is relevant to your organisation and can assist in your internal or external communication. Identification and valuation of externalities and co-benefits: Projects or activities targeting one type of benefit typically also lead to additional expected or unexpected benefits and sometimes costs. Externalities are “consequence of an industrial or commercial activity which affects other parties without this being reflected in market prices”. Valuing co-benefits and externalities leads to better-designed or considered interventions and decisions. Our experienced economists are well-versed in economic techniques used to identify and value co-benefits and externalities. 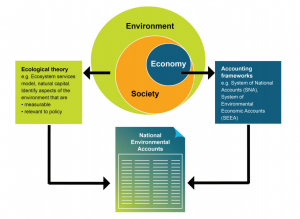 Environmental Accounting advice: Our economists can provide advice on how Environmental Accounting can assist your organisation in making better decisions or on how Environmental Accounts can be developed for a specific environmental asset or a region. Please contact us if you are interested in this topic or have specific questions.